He was the ultimate British Modern Jazz Legend, a player who perhaps did more than any other in raising the bar expected of UK jazzmen, and who in turn alerted America to the fact that not all Hard Bop big hitters need come from New York or Chicago. 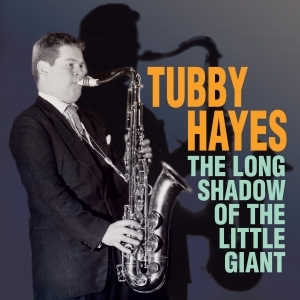 Indeed, so towering were the many talents of Edward Brian Tubby Hayes that early in his career he was tagged with the nickname The Little Giant, a joint acknowledgement of his short stature and imposing musical brilliance. He's recently been accorded the long overdue honour of a full-length biography – The Long Shadow of The Little Giant: The Life, Work and Legacy of Tubby Hayes (Equinox Publications Ltd.) - hailed by Jazz Journal magazine as “a strong contender for jazz book of the year” - and in this accompanying 14-track survey author and tenor saxophonist Simon Spillett cherry-picks highlights from the first decade of Hayes' turbulent career. He's heard with his own quartets, quintets and big band, as a member of the co-led Jazz Couriers, at home in London and abroad in the USA, offering dazzling examples of his tenor saxophone, flute and vibraphone skills. Also featuring contributions from such legendary jazz names as Roland Kirk, James Moody, Ronnie Scott and Phil Seamen, these 14 recordings showcase Hayes as the paragon of hip. Packaged with fascinating notes, rare photographs and a previously unissued bonus track, this volume makes the perfect introduction to this most incendiary of jazz icons.